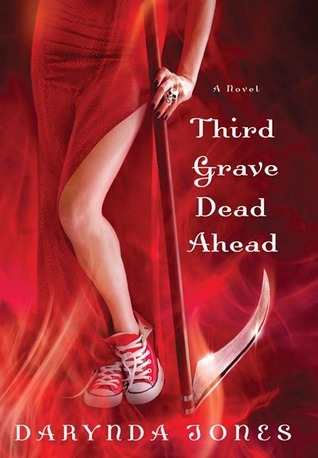 Third Grave Dead Ahead (Charley Davidson, #3) by Darynda Jones. Publication : January 31st 2012 by St. Martin's Press. I want Fourth Grave Beneath My Feet and I want it NOW! For those of who haven't read any book in this series yet - What're you waiting for?? Get it, like right now!! Charley's the grim reaper. Yup! She's the gateway between Heaven and Earth, the person sought by dead souls from all over the world to help them 'move' on. She's not your traditional black-hooded-scythe-holding grim reaper though. Charley works as a Private Investigator during the day, mostly to keep up appearances and well, make some money. By using her 'abilities', Charley manages to be a damn good PI too. She's brave, witty, funny and just AWESOME! This is a paranormal series any one would love, just for the amazing characters, humor and my favorite one of all - Reyes. *sigh* Reyes, Reyes, Reyes. You take 'bad boy' to a whole new level! Ah, you make my heart race and my toes curl. Damn, I wish you were real! For the rest of you, who have read the previous two books in this series and love Charley & Reyes like I do - Third Grave Dead Ahead definitely didn't disappoint. In fact, it's by far the best in the series till date. The plot, as usual, is excellent. Charley's as funny as ever! There's also some new characters that I really like. This book goes deeper into Reyes' past - the time before he got arrested and we understand more about what Charley is capable of. Trust me, you want to get read this one asap! There isn't one slow moment in this book. To me, Third Grave Dead Ahead just raised the bar. This series just went from being one of my favorites to I'm-DYING-for-the-next-book. I cannot thank Darynda Jones - the author of this awesome series - and her publicist at St.Martin's Press enough for giving me an ARC of this book! I LOVE this cover! And the book sounds great also. I haven't read any of the books yet, but I really want to. This review makes me even more excited to start the series!